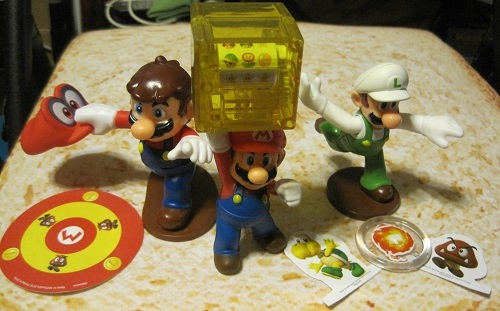 McDonald’s recently had more Mario themed toys in their Happy Meals. And thanks to my family, I managed to get them all. So I figured I’d show them to you here. Unfortunately I don’t think that McDonald’s is still doing this promotion at the time of this writing. I wanted to post this earlier but I just couldn’t find the time. But sometimes McDonald’s will give out old toys if they run out of new ones so maybe you can still get them. Anyway, let’s take a look at what they are. So the first three are of Mario and his brother. The first toy on the left has Mario holding his Cappy hat with eyes from Super Mario Odyssey. You’re supposed to twist Mario and he’ll throw the cap and you try to land it on a target. But he really just looks like he drops the hat. The next toy is of Mario jumping to hit a block. Press him up into the block and icons spin in the block and you try to get them to be all three stars, like a slot machine. But they don’t spin independently like a slot machine, so the only combination you can get three of in a row are stars. But I guess that’s asking too much from a Happy Meal toy. Last is Fire Luigi. You’re supposed to get him to throw the fireball to hit the targets, but for the life of me I couldn’t figure out how to get him to hold the fireball. Next up are ones featuring Yoshi. First is a spinner. You hold the button to spin the wheel and release it to stop. 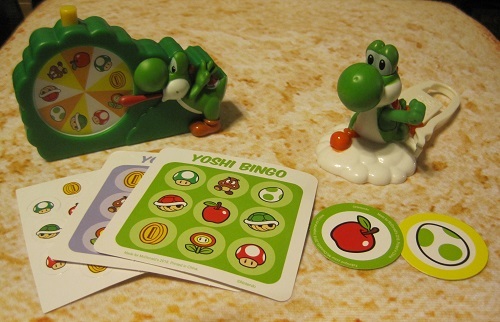 Then you can play a game of Yoshi Bingo with the included cards. Pretty cute. The other is one of Yoshi in the clouds, and you’re supposed to use this plastic thing to shoot him out to hit targets, but I couldn’t figure out how to get it to work. The last three toys are the least impressive. 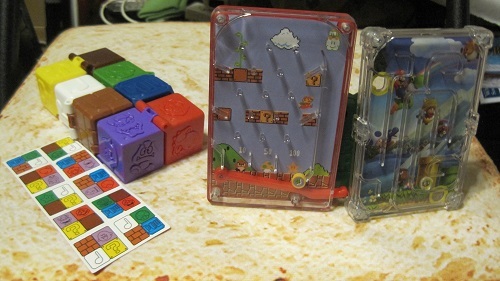 One is a foldable block puzzle featuring blocks from the Mario games (Question Block, bricks, note block, etc.). You have these pieces of paper that show you a pattern to make, but it’s not very hard. Next is a pachinko pinball type of game. The classic Super Mario Bros. background is kind of neat. And last is a marble maze game with two sides. I like the Mario with the block.